One of the unpleasant things you discover when you sit in major league baseball press boxes from time to time is that the press -- or at least the print media -- actually do not like close baseball games. A walk-off home run or a blown save means that they have to re-write their lead paragraph and perhaps their entire game story, leading to angry phone calls from their editors, and forcing them to work later than they might otherwise like to. Is this shift really a result of the economic crisis? I believe that's part of it, but I believe there are at least two other factors at work as well. [We] should evaluate the robustness of the Republican bounce by how well it holds up to the currents of political time, rather than any specific date on the calendar. Specifically, I would want to see how the bounce holds up to the next major development of the campaign, particularly if it is a pro-Obama development. For example, let's say that Colin Powell endorses Obama tomorrow morning. I might expect a fairly strong reaction to this in the polls, not because the endorsement is all that important unto itself (most endorsements aren't), but because it displaces the GOP Convention as the most recent event of the campaign -- it pushes political time forward. And if the polls didn't move in reaction to such an endorsement, I'd think Democrats would have reason to worry. The Wall Street crisis was the first major event of the post-convention news cycle -- the first thing that really tested the robustness of the Republican bounce. And what happened? The bounce proved to be about a mile wide but an inch deep. McCain consolidated elements of his base (evangelical conservatives) during the Republican convention; Obama did likewise with many Clinton Democrats during his convention. 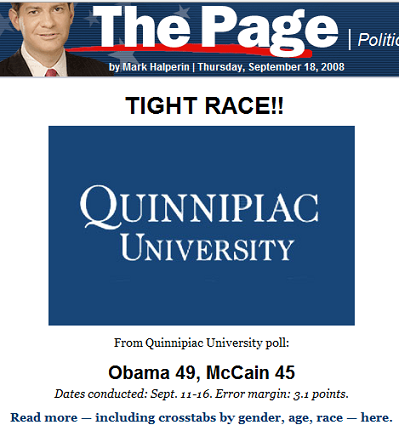 But the two campaigns also had a tug-of-war over independent voters, with first Obama and then McCain winning them over. Independents, however, are notoriously fickle in their Presidential choices, and as the afterglow of the Republican convention wore off and was replaced by news about the economy, they reverted back to the equilibrium point they've been at all year, roughly splitting their votes between the two candidates (Quinnipaic has independents dividing their vote 46-45 as of this morning). Palin's average favorability score is now a +7 -- about 10 points behind Joe Biden's numbers. Perhaps more importantly, these numbers are 10-15 points behind where Palin's numbers were just a week or so ago. If voters come in not knowing very much about a candidate -- and the more they see of the candidate, the less they like of the candidate -- this is a major concern. The McCain campaign may be in some trouble. We should learn over the next several days, as further polling results roll in, whether they are in a little trouble or a lot of trouble. I would certainly not rule out the latter possibility. There are now 46 days left until the election. The Obama campaign must feel like, if they can spend 35-40 of those days talking about the economy, they are in a very strong position. Excepting the three or four days surrounding the foreign policy debate in Mississippi next week, and the residual possibility of an unanticipated foreign policy crisis, the inertia of the campaign probably means that they will have the opportunity to do so. Unless, of course, the McCain campaign can throw up some roadblocks and distractions. McCain's is a creative campaign -- more creative in many ways than the Obama campaign. As such, we should not discount the possibility of their finding an effective way to alter the momentum, perhaps one -- like their 'celebrity' critique of Obama -- that was difficult to envision in advance. At the same time, the campaign cost itself a lot of credibility -- certainly with the media, and to a lesser extent with voters -- with some of their shenanigans of the past week, most notably Lipstickgate, "Thanks, but no thanks", and the Obama kindergarten commercial. To use a crude metaphor, the McCain campaign may have blown its wad too early. Organic shifts in the momentum of the race can and probably will still occur, but they may find it more difficult now to synthesize one.